During World War II, maps were often sewn in to the lining of the A-2 flight jackets in case the pilots were shot down over enemy territory. 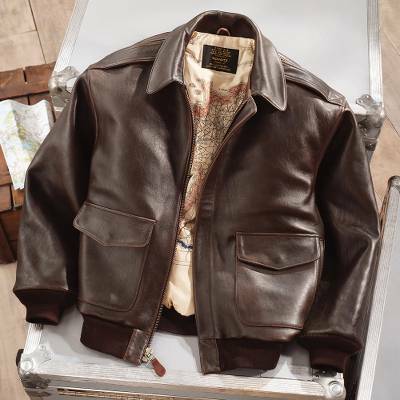 This is a reproduction of the historical WWII flight jackets, originally issued in 1931 and then worn by the allied pilots who flew perilous missions over wartime terrain, and the lining features a re-creation of the survival maps of southern France. A surface of vintage French lamb leather adds to the authenticity. Features include some of the customizations that pilots preferred, such as the wind flap, front zipper with storm flap, hidden snap-down collar points, knit cuffs and waistband, and flap-top and side-entry pockets. You can find men's leather A-2 flight jacket 'Road to Victory' by National Geographic in clothing categories such as Nat Geo Jackets, Nat Geo Gifts Jackets and Leather Jackets. Enjoy exploring these sections for other Novica treasures. "Best jacket I've ever had"
I just bought my 4th copy of this jacket over the past 30 years. It is the best and warmest winter jacket I've had. My only complaint has been that the lining will start shredding over time. But even with that, I had my last one for at least 7 years before buying this one.